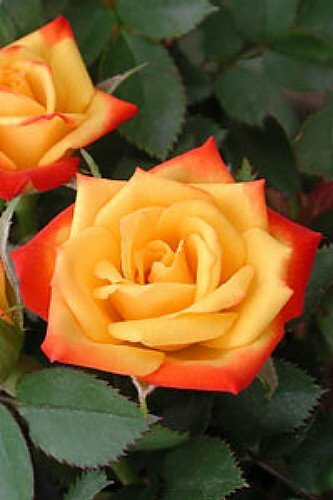 Yellow with a red edge, very fragrant Compact growing habit with a maximum height & width of 6-12 inches Easy to grow, disease-resistant roses that are self cleaning and low-maintenance Hardy to Zones 4b to 11 or house plant in a sunny window The starter rose you will receive is growing in a 4" pot. Shipped dormant in the winter and early spring months. They are very versatile and can fit into any landscape among shrubs, annuals, perennials, in mixed beds or borders. They love the sun. Compact growing habit with a maximum height & width of 6-12 inches. Hardy to Zones 4b to 11 or house plant in a sunny window.